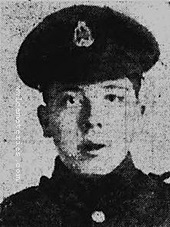 Husband of Mary E. Shelmerdine, of 6, Ashlynne, Ashton-under-Lyne. 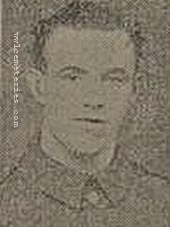 Private James Shelmerdine, 351762, of the 9th Battalion, Manchester Regiment, was born 21 January, 1890. He was the son of James Shelmerdine and Sarah Burrows and was born in Arlington Street, Ashton under Lyne. He worked for Ashton Electric Company. He married my great aunt, Mary Elizabeth Dean, daughter of John Herbert and Charlotte Alice Dean of Ashlynne, Ashton under Lyne, 12 June, 1915. 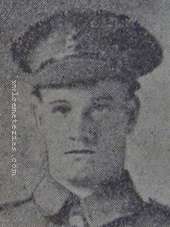 He was awarded the Military Medal in 1918. This was reported in the Ashton Reporter in July 1918.He was killed Thursday, 21 March, 1918. His name is on the Ashton under Lyne War Memorial and his medals are in the Manchester Regiment Museum in Ashton under Lyne. He, along with my other great aunt's husband, George Dickinson, are also remembered on John Herbert and Charlotte Alice Dean's headstone in Leyland cemetery. Picture courtesy of Vivien Ellis, great niece. 27th March 1918, aged 32. 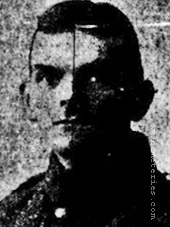 Lance Corporal Joe Shepherdson 37898 Northumberland Fusiliers, formally a private in the Northern Cyclist Battalion, Killed on the 27th March 1918, husband of Sarah Shepherdson formerly Irwin of 8 Riddle Terrace, Coxlodge, Newcastle upon Tyne. 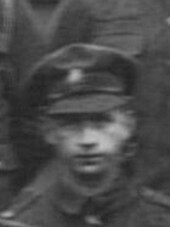 21st March 1918, aged 18. Son of the late John and Ellen Shufflebottom. In Memory of my great Uncle Samuel who, like so many others (some only children), never had the chance to live the life that he deserved. Samuel was the younger brother of my paternal grandmother who had already lost her husband when HMT Royal Edward was torpedoed August 1915. Grandson of Mrs. Jane Wood, of 11, Khyber St., Colne, Lancs. 4th Bn. (Queen's Own) Hussars, Attd. 9th Bn. Tank Corps. 30th March 1918, aged 46. Husband of Hannah Smith, of 4, Oldham Villas, Matlock Bank, Matlock, Derbyshire. 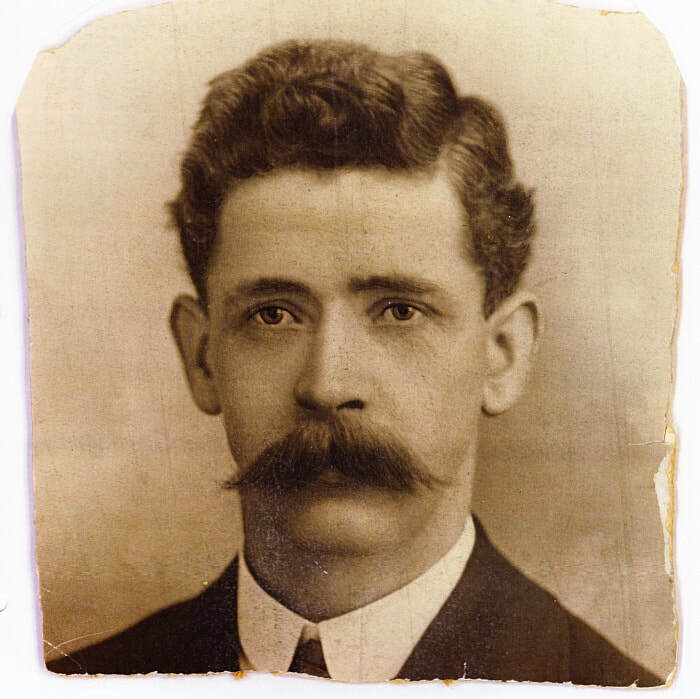 Isaac was my maternal Grandfather. My husband and I visited Pozieres Cemetery in 1994 to witness his name on Plaque 13, sadly, there is no known grave. We wish to express our love and thanks for his courage in battle and to all his comrades who perished for our country. Wendy (nee Higton) and Arthur Manock, Eccles, Manchester, England. 29th April 1918, aged 29. Husband of Rosa P. Spencer, of 94, Melville St, Burnley, Lancs. 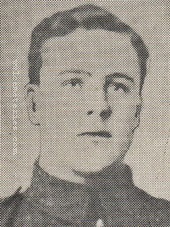 Son of Lily Stewart, of 22, Stewart St., Lochee, Dundee. and the late David James Stewart. 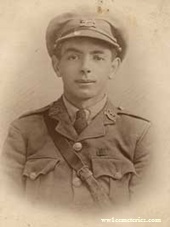 21st March 1918, aged 21. Son of Mrs Waddington, 12 Essex Street, Nelson, formerly 33 Curzon Place, Colne. Formerly employed at Colne Railway Station, he died on a forced march whilst a Prisoner of War. Son of Henry and Hannah Wallace, of 109 Clitheroe Rd., Sabden, Blackburn. 22nd March 1918, aged 23. Son of Joseph and Catherine West, of 14, Church St., Barrow-on-Soar, Loughborough. 2nd/2nd East Lancashire Field Ambulance. Royal Army Medical Corps. Son of Tom A. and Alma Louisa Whitham, of 77, Ebor St., Burnley, Lancs. 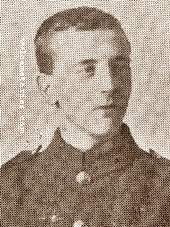 John Ryrie Webster D. S. O., M. C.
22nd March 1918, aged 31. 24th March 1918, aged 21. Pictured with his two Brothers; Alan (left) a Sergeant in the Durham Light Infantry Regiment who fell and is buried at Maroeuil on 18th of February 1918, aged 22; and Howard (right), who was also severely injured on the Somme, but was repatriated to their home town of Scarborough and died of his injuries in hospital there, aged 19. He was therefore buried at home. 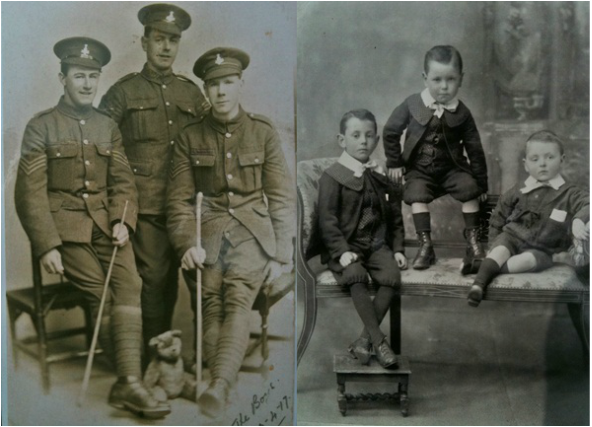 The second picture shows them as small boys, in the same positions. Picture courtesy of Paula Smith; their Great Niece and Granddaughter of the surviving son Stanley, who was not allowed to sign up, due to the loss the family had already suffered. Son of Dorothy Agnes Wood and Daniel Wood of 582, Newchurch Rd., Stacksteads, Lancs. 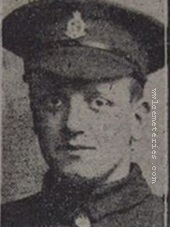 202151 Private Craven Wood, “C” Company Scout, 2nd/4th East Lancashire Regiment, killed in action on 21st March 1918 in the Hargicourt area of France, aged 20. The son of Daniel and Dorothy Agnes Wood, Craven was from Newchurch Road in Stacksteads, Lancashire. 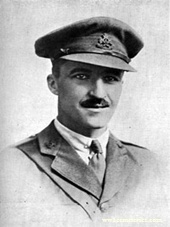 Craven fought in the latter stages of the Battle of Paschendael at Poelcappelle, when the 66th Division sustained heavy casualties in October 1917. 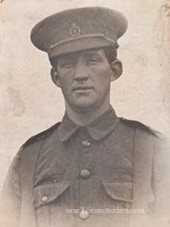 He returned home at the end of January 1918 to attend his Brother Fred’s Wedding and sent his last correspondence on a post card dated February 12th 1918 to his worried sisters, telling them that he had landed in France and was alright. Craven is remembered on Panels 42-43 of the Pozieres Memorial. When Craven died in 1918, his Father was inconsolable and it is thought that the loss of Craven was the rapid cause of deterioration in Daniel’s health and he died literally of a broken heart! 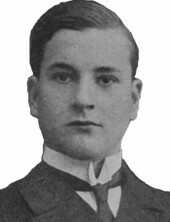 The CWGC states that Craven's death was the 21st March 1919 when actually it was exactly a year earlier. They also state that his Father was dead but at the time of his son's death he was still alive. The CWGC registers were done in the 1920’s, so technically they were correct in that he was the late Daniel Wood. ​Craven had 4 brothers who also fought during the war. Lewis the youngest was in the Royal Navy, Fred was in the 11th Service Battalion East Lancashire Regiment (Accrington Pals), Dyson fought in several regiments of the Australian Imperial Force and Bill, the eldest, was in the 6th Battalion Loyal North Lancashire Regiment. 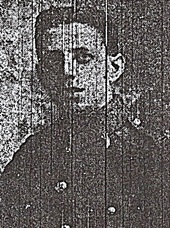 Craven was the only brother to be killed in action. The group picture of C Company was taken either in Crowborough or Colchester Barracks before the Battalion went to France. Craven is on the right hand side of the middle row. I have found only one surviving Service record of the 2nd/4th East Lancashire Regiment which belongs to Harry Barber, who lived ¼ of a mile away from Craven and I have a sneaking suspicion that the young man sat next to Craven is him. His Army No. was 202153 and he signed up in Bacup, Lancashire. Further to the Group picture of 2/4 East Lancashire Regt attached to Private Craven Wood 202151 (Pozieres Memorial) I can now identify two soldiers. Sat next to Craven on the left of the picture is indeed Private Harry Barber 202153. 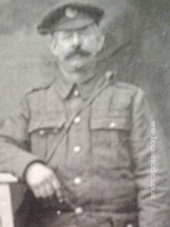 Stood centrally and immediately behind Craven and Harry is Private Herbert Knight 202152. All three attested together at Bacup Recruiting Office, Lancashire, in December 1915 under the Derby Scheme and landed at Crowborough Barracks on 24th January 1916. Please get in touch if you can put a name to any of the faces in the picture of C Company above. We will forward your email onto Peter.